Adesto Technologies is a company you probably haven’t heard of. I’m here to fix that, thanks to a discussion I had today with their CEO, semiconductor veteran Narbeh Derhacobian. Adesto is announcing a whiz-bang new product next week, but you need to know about this company now. Their focus is low-power memory solutions – i.e. components designed to solve specific customer problems – for mobile and IoT applications. They’ve shipped over 1 million units of their Conductive Bridging RAM (CBRAM), a form of resistance RAM (ReRAM or RRAM). Regular readers know StorageMojo has been a fan of ReRAM for years. And I hadn’t heard of Adesto either. According to Narbeh, Adesto’s killer app is storage for the Internet of Things. The “Things” need a sensor, processor, power, radio and – ta-da! – local storage. Since nobody is going to change a several billion batteries a year, the ideal IoT device harvests power from the environment. Which makes low power everything critical. While NAND flash is cheap, it is also thirsty, requiring ≈20v for writes and, typically, 3.3 volts. Narbeh says that Adesto’s CBRAM is 10-100 times more energy efficient than NAND today. 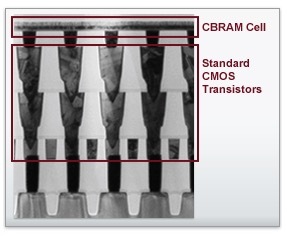 Current CBRAM products run at 1.5V. Which leaves the future. As a science experiment for a DARPA project, Adesto demonstrated CBRAM could work down to 0.6V. Currently 2 foundries are producing CBRAM and Adesto is looking to bring on a third. Adesto’s CBRAM Technology is the lowest power, lowest cost non-volatile memory for mainstream and embedded applications. The non-volatile memory is created by applying patented metallization and dielectric stack layers between CMOS interconnect layers. The size of the memory cell is determined by the underlying access transistor (whether using a Logic or DRAM process). The result is a superior NVM with long-term CMOS scalability. CBRAM™ memory was originally developed at Arizona State University and is also known as Programmable Metallization Cell (PMC). CBRAM isn’t perfect: device capacities are tiny; it isn’t a drop-in replacement for NAND; and volumes aren’t ready for popular consumer devices. But those are all manageable problems. It is in the nature of storage conservatism that we use what we’ve got until we can’t. Flash grew up filling a mobile niche that disks couldn’t until, finally, it became cheaper than DRAM. Now CBRAM is growing up in a niche that flash can’t handle, IoT. Given IoT’s promised volumes – billions – learning curves will drive CBRAM prices down and perhaps making them capacity and price competitive with flash for consumer and enterprise applications. However Adesto goes, it’s good to see a ReRAM product shipping in volume and a business model that leads to long-term success. How this will affect adjacent storage markets remains to be seen, but we can be sure that energy efficiency will remain important for IoT, mobile and web-scale infrastructure.